When you have a cat, you’ll want to make sure he has everything he needs to stay fit and healthy! From the proper care to the food he eats, everything must be taken into consideration. Feed your cat kitten food. Kitten food is more calorie dense than adult cat food with higher percentages of protein and fat. Wet kitten food is the best option as it is more appealing – even the fussiest of cats will be compelled to eat some. But what happens if your cat is underweight? While food is the answer, the solution is a bit more complicated than just adding more food to his bowl, especially if he doesn’t like to eat in the first place. If you’re not sure how to fatten up a cat, then read on as we show you some methods and tips to help your cat bulk up and maintain a healthy weight. Why is my cat skinny? When looking at a very skinny cat, you may suspect he is malnourished. Lack of nutrition is one of the most common reasons for a cat to be underweight and need fattening up. His food intake may be all right, but what he eats lacks nourishment. Some owners only feed their cat junk or human food from the table, which can be why he doesn’t get enough calories and nutrients to sustain his weight. Your cat might just be picky with what he has on his plate! Many cats are picky eaters, especially if they aren’t used to a new type of food. Some cats tend to either pick at the cat food or choose to leave it behind during mealtime. Lack of appetite or drastic loss of weight is one of the most common symptoms of any disease. If your cat is suffering from a condition which has him feeling uncomfortable and unable to eat, then you should consult your vet. If your aging cat suffers from various conditions, then he may begin to lose appetite and weight as well. Before you choose to increase your cat’s weight, check what he needs with his veterinarian first. Ask about your cat’s ideal weight range and find out how much he needs to gain. Also be sure to check if your cat’s low weight or lack of appetite comes from an illness. Let your veterinarian prescribe vitamins or medicine, if needed. Have your cat come back for checkups to make sure he is in his proper weight range. If you recently bought a new type of cat food, make sure that the change is gradual, so your cat can get used to it. Add a bit of the new cat food to the old one. Gradually increase the amount of new cat food per day while proportionally lessening the old one until he is used to what he’s eating. The cat food you offer your cat might not have enough nutrients per serving. I recommend you choose the best cat food you can such as premium cat food which is full of high quality protein and vitamins, such as Wellness Signature Selects Natural Canned Grain Free Wet Cat Food. Always check the label and nutrition facts before purchasing, as many generic cat food brands contain fillers and preservatives. If your cat doesn’t like cat food because of the flavor, then it’s time to switch it up by adding more taste to it! Add any type of fish oil, whichever is your cats’ favorite. The oils also help with weight gain as they contain a substantial amount of needed calories and fat. Personally, I find Pure Wild Alaskan Salmon Oil for Cats & Dogs to be a very good choice. If your cat still doesn’t like his food, then you can try specialty-made gravy for pets. Adding protein-rich treats between his meals is great, too! Additionally, “human food” such as cottage cheese, egg whites, vegetables or yogurt are recommended since they have extra calories and can be a yummy treat to help fatten your cat. Believe it or not, kitten food might be a better meal choice for cats that need to gain weight! This type of food has a lot of protein and fat compared to adult cat food, so focus on getting grain-free and high-quality kitten food that has NO fillers. Kitten food can be good for cats who are either picky eaters or aging cats who need something softer to chew on. 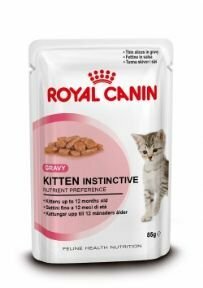 As a recommendation, you could try Royal Canin Babycat Instinctive Loaf In Sauce. To keep your cat healthy, you must make sure he maintains the right weight. Not only will this help your cat look cute and cuddly, but it will help his organs function well so he can live for many years to come! If your cat is skinny, remember there is more to gaining weight than simply adding more food. It takes the right food for your cat’s needs for him to gain weight and become robust and active! I hope that this article helped teach you how to fatten up your cat. Now, you’ll be able to get your cat the proper food and encourage him to eat up so your cat will stay healthy and active. What are you waiting for? If your cat seems underweight, it’s time to fatten him up and get him back to the peak of health! If you have any other questions or tips to fatten up a cat, then comment below! I would love to hear what you think.